HandTrucksRUs.com > Platform Material Lifts > Hydraulic Scissor Table - 770 lb. Wesco Hydraulic Scissor Table - 770 lb. 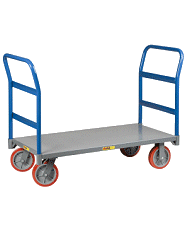 The TFD Series Lift Table Carts are ideal for lifting cargo and items with ease. Lift and lower heavy loads for smooth, easy loading and unloading! Ideal for transporting shop machinery, large tool boxes and cargo too heavy to lift manually. Additional uses: Loading and unloading cargo from vehicles. Stocking shelves without any bending. Work on engines or other machines at a comfortable and convenient position. Many professional have come to depends on the TFD Series for their solid state construction and high quality performance. This cart is solid and well constructed. Assembly was very easy. Also easy to operate, however it's a bit heavy to push if the ground is slightly inclined.